Well, Hello Hollie! Sure to make a statement, Hollie combines a breathable soft leather upper with a chunky by lightweight leather sole. These are shoes that will stand out from the crowd. As an added bonus, they’re orthotic friendly too. 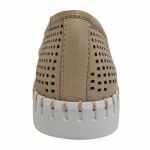 The padded removable inner sole means everyone can enjoy turning heads in this casual, comfortable delight.